On the dust jacket of my book, Who Owns America’s Past, there is a blurb from Dr. Deborah Douglas, Director of Collections at the MIT Museum and a marvelous historian. Debbie calls it “part history, part memoir, and part polemic,” and I’ve had to admit that she “got” my book in a way I never intended. The book addresses ways in which the Smithsonian Institution—in particular the Museum of American History and the National Air and Space Museum—has put artifacts on display, and on that basis it can also be separated into three parts, in a way I fully intended. The conventions for exhibits are categorized under three different headings. First, there are exhibits of one particular type of artifact that are collections-driven—a Hall of Horology, Railroad Hall (pictured above), and so on. When artifacts are small, such as clocks and watches, there may be dozens or hundreds of them arrayed in display cases. 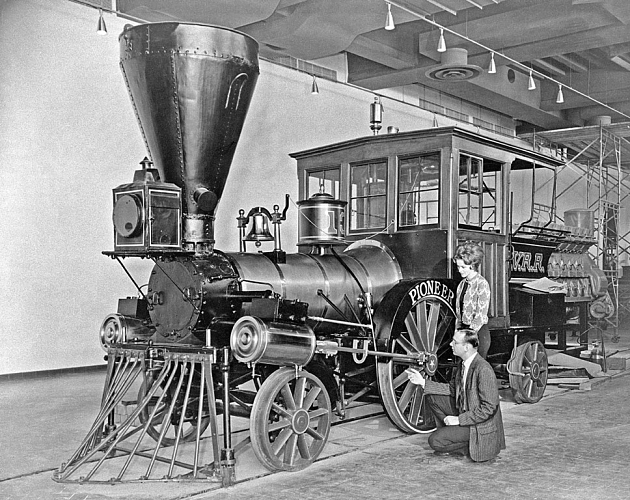 When they are large, as with locomotives, one or two of them may dominate an entire exhibit hall by their dramatic presence. Then, there are exhibits that can be called story-driven, often with names like the titles of books—We the People, Suiting Everyone, A Nation of Nations (pictured right). In conceiving such exhibits, a narrative is developed first, and artifacts of many different kinds are then deployed like illustrations in a book. 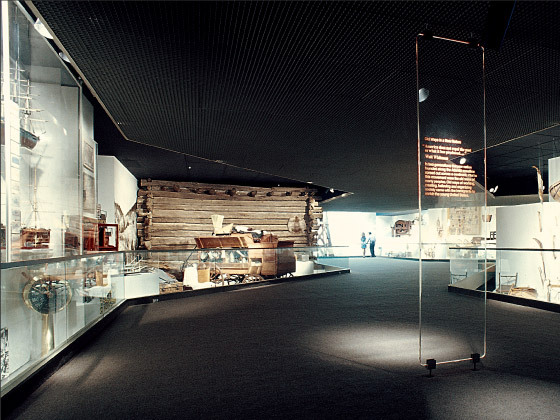 Sometimes the techniques of exhibit design, such as dramatic lighting, are as striking as the artifacts themselves. Finally, there are exhibits that are best called postmodern. A pioneering example of this, The Henry R. Luce Hall of News Reporting (pictured below). Here, “real” artifacts are intermixed with “props,” and together they are exhibited in whatever historical context seems to offer the most potential for immersing an audience in some sort of “experience.” Can’t you hear the sculpted newsboy calling, “Extra! Extra! Read all about it!”? It is tempting to cast these three kinds of exhibits in an evolutionary sequence, from spare taxonomies with only one tale to tell, to the collaborative inventions of storytellers (curators) and dramatists (designers) selecting from many possible options. Even today, however, the Smithsonian still stages collections-driven exhibits, one reason being that the other two types are much more expensive to mount. Both are design-intensive, and postmodern exhibits also involve costly elements of “experience”—sound, fury, electromechanical interactives. Exhibits of this type are almost always a product of “outside” funding, corporate or institutional. Are we to assume, then, that they may harbor some sort of “spin,” to the order of donors? Would The Henry R. Luce Hall have feature Time and Life at the expense of Newsweek and Look? Bob Post received his Ph.D. from UCLA in 1973, and then was employed by the Smithsonian for twenty-three years, as a technician, historian, editor, and exhibit curator. Exhibits are the subject of his latest book from Johns Hopkins University Press, Who Owns America’s Past? The Smithsonian and the Problem of History. 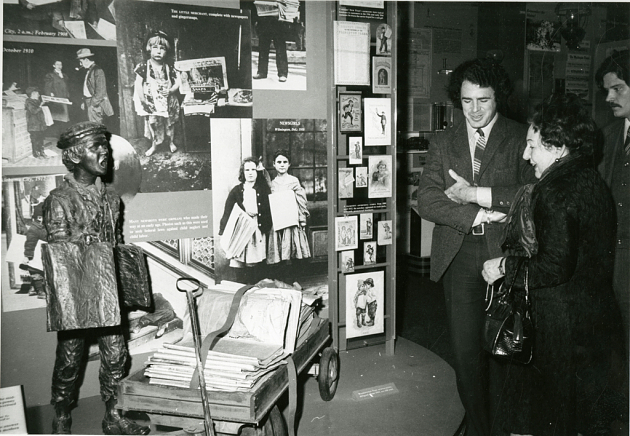 Pictured in the photos above, showing off exhibits for which they were responsible, are two of his most esteemed colleagues: Jack White (with the locomotive), also an prizewinning Johns Hopkins author, and Peter Marzio (with the newsboy), who followed his Smithsonian tenure with a distinguished career as director of the Houston Art Museum. A note of clarification: The Museum of American History opened in 1964 as the Museum of History and Technology; the name-change took place in 1980.